SDSU student Sinai Cota studying abroad in Venice. College is a critical time for growth and development, and this growth should be intellectual, personal, and professional. So much of the dialogue about college today is around a false dichotomy between intellectual and professional development. These should be viewed as complementary and mutually reinforcing aspects of the college experience. For example, a student interested in international business should consider learning about specific business practices through an international internship that facilitates learning about another culture's norms and traditions—a holistic approach that is essential to addressing the profound geopolitical challenges we face in such areas as environmental remediation and national security. Why is addressing real-world challenges integral to a college education today? The university is enriched dramatically by engaging with society's challenges. Colonial colleges, such as Harvard and Yale, focused on the education of clergy because clergy were viewed as essential to the welfare of colonial society (not to mention the salvation of its members). Today, we face extraordinary challenges in such areas as the environment, biomedical research, global cooperation, and income inequality. Bringing such issues into our educational and research programs enriches our intellectual life, helps us explore novel solutions, and prepares our students—who are society's future leaders—to address these pressing challenges. At San Diego State University's Zahn Innovation Center, for example, 38 teams of students, faculty, staff and alumni are creating startup companies and social enterprises designed to create renewable energy and water sources, enhance vehicle safety, reduce homelessness, and more. San Diego State University is also a leader in study abroad programs. Why is international study so vital? Today, every problem, every issue, every professional role involves global issues. Medicine—consider the impact of migration and transport of goods on the spread of infectious diseases. Social work—consider the differences in socio-cultural contexts facing migrants from Africa, Central America, and Asia. International perspectives are necessities. My goal is for every San Diego State student to have an international experience. How should a university handle the complex freedom of speech issues arising in response to the Israeli-Palestinian conflict? The popular conception of the role universities should play in the Israeli-Palestinian conflict is extremely problematic and, quite frankly, a nightmare for universities. There are three facets of this conception that produce significant challenges. In this context, the most important thing a university president can do to promote civil dialogue is to help members of the community understand the fallacies underlying these popular conceptions, as well as the appropriate role the university can play. The first conception is that universities have a responsibility for resolving the Israeli-Palestinian conflict. This often translates to efforts to bring Jewish and Muslim students or scholars together on campus. I strongly support efforts to integrate the rich diversity of our campuses, but it is not fair to any of the participants to tie such initiatives to a resolution of a conflict that has baffled the greatest diplomats and most powerful leaders of our time. The second, related conception is that the university as an institution should be taking sides in the Israeli-Palestinian conflict. In this view, one side is good, the other is evil, and the university should be using its resources to support what is good and punish what is evil. This conception ignores the fact that it is not the role of the university to take sides in geopolitical conflicts. Instead, universities can, and should, create conditions that allow for discussion and analysis of global conflicts. The third conception follows closely upon the second: Given that one side is good and the other is evil, the university has the moral responsibility to suppress the speech of the evil side, which includes cancelling lectures, denying academic credit, and being inhospitable to scholars and students who hold opposing views. This view is not only wrong—free speech is essential to the health of an academic community and, if we err, we should err on the side of protecting speech—it is wrong-headed. If one side is patently wrong, it is to the other side's advantage to let the weakness of the opposing argument be made clear to all. Universities should promote the study of geopolitical issues and provide forums for discussion of a variety of perspectives, but they should not take sides on, suppress speech about, or be expected to solve geopolitical conflicts. You are a former associate editor of the Journal of Experimental Psychology: Learning, Memory & Cognition. What insights can you share about the best way for students to integrate learning? I'll mention two things. First, from a psychological perspective, the key to learning is making meaningful connections between the things you know and the things you are trying to learn. For example, one can understand and retain a physics concept such as conservation of momentum by examining how it affects outcomes in a game of pool. Second, from a physiological perspective, students need to do everything possible to maintain underlying brain functioning. Proper maintenance includes sufficient sleep, good nutrition, emotional balance, and limited use of substances such as alcohol and other drugs that impair learning capacity. 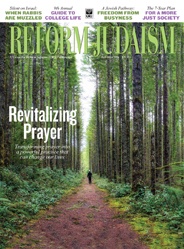 How has Judaism influenced you personally and professionally? Following in Jewish tradition, I'll answer a question with a question by saying, "In what way have Jewish values not influenced the work I do"? There are obvious aspects, which include a focus on social responsibility, an inclination to use scholarly analysis to solve practical problems, and an understanding of the challenges facing minority groups. More subtly, and something I have only come to recognize over time, has been the influence of the rabbinic leadership of my youth on my own leadership style. I was raised in a Reform congregation, Anshe Emeth Congregation in New Brunswick, New Jersey. Rabbi Harvey Fields was the congregation's leader during much of my childhood. Recently Rabbi Fields passed away, and as I read his obituary in the Los Angeles Times, I was at first surprised to see the close parallels between his leadership style and my own. Of course, it could not have been any other way, since he was, in fact, the only public leader I knew as a child. It's a great example of the old saying that "a teacher affects eternity," and a reminder of how important the rabbinic tradition is to Jewish and secular culture. Elliot Hirshman is the president of San Diego State University. The RJ Insider's Guide to College Life is a collaborative project of Reform Judaism magazine and Hillel International. Read the digital edition. Learn about Reform college programs. Learn about Reform Israel college programs or call 212-650-4070. For more information, access Hillel's College Guide, which provides numbers and percentages of Jewish students, descriptions of Jewish life, links to Hillels, and more.